A few months ago, we started the journey to bring the PowerShell experience in to Azure Cloud Shell. Today, that experience enters public preview alongside Bash in Azure Cloud Shell. With the addition of PowerShell in Cloud Shell, now you have the flexibility to choose the shell experience that works best for you. Authenticated shell access to Azure from virtually anywhere. Common tools and programming languages in a shell that’s updated and maintained by Microsoft. Resource group scoping for Azure PowerShell cmdlets, when within the context of a resource group path in the Azure drive (Azure:). Context-sensitive command list using Get-AzureRmCommand. It only lists commands that are applicable to items under the path in Azure drive (Azure:). Rich PowerShell script editing using VIM, which provides built-in syntax highlighting and IntelliSense for PowerShell files. An extensible model for adding new commands (via modules and scripts) from the PowerShell Gallery, which automatically persisted across your Cloud Shell sessions. Enables interactions with VMs using PowerShell remoting to enable management of guest VMs. Find more details about the features and tools incorporated into the PowerShell experience in Cloud Shell. Whether you're an experienced Azure user or new to the platform, Cloud Shell offers low-friction access to learn and use Azure PowerShell commands. Using Cloud Shell, you can easily automate and manage resources at scale from the comfort of the Azure portal. Azure PowerShell documentation is now fully interactive with the addition of PowerShell Try It button. This addition enables an immersive learning experience for Azure PowerShell scenarios and samples. 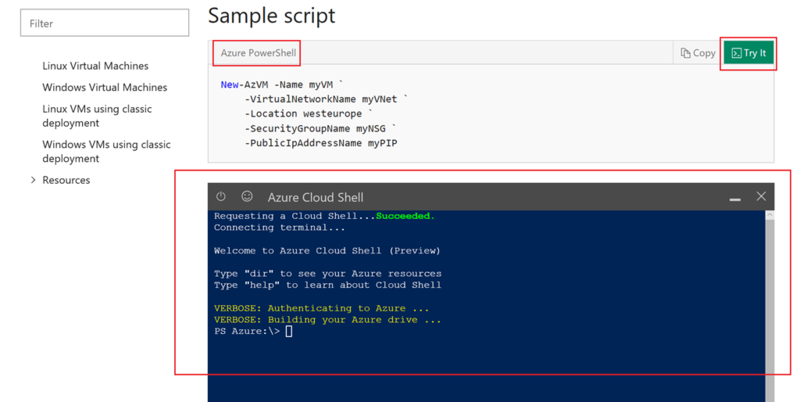 The integrated PowerShell environment in the Azure documentation uses the same PowerShell in Cloud Shell experience that is available from the Azure portal. Try this experience today in the Azure PowerShell tutorials. 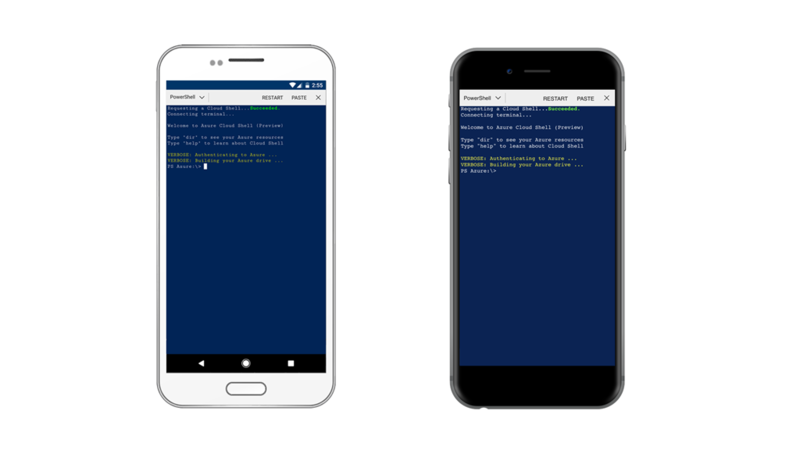 PowerShell in Azure Cloud Shell is also available on the Azure mobile app enabling you to take this experience with you, wherever you go. Saving in-progress work across devices is where it starts to get interesting. With the power of the Azure mobile app, you have access to any script in your CloudDrive, from virtually anywhere. 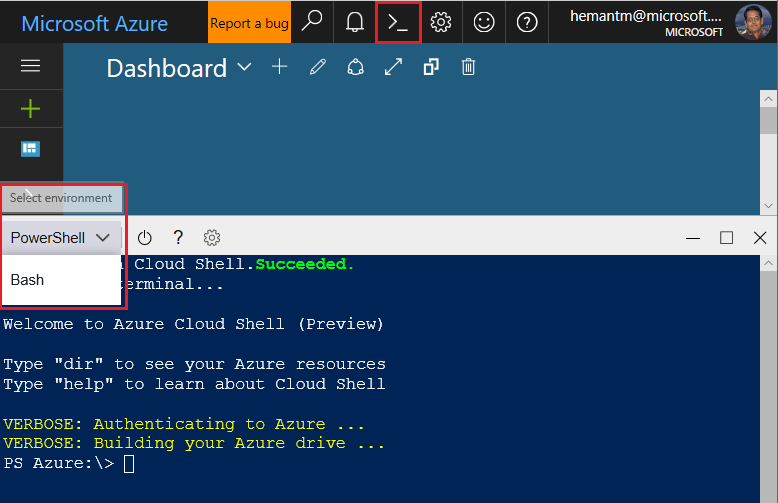 Launch Cloud Shell from the top navigation bar of the Azure portal and select PowerShell option from the shell drop-down list. Learn more details about Azure Cloud Shell. Thank you to our private preview users who helped shape the current experience by providing valuable feedback via issues and feature requests. We encourage you to continue your support by sharing your thoughts, experience, and input through Azure Cloud Shell UserVoice.